Saturday is usually the day Bob does laundry, but his sister and niece came to town, which was something we’d looked forward to. He waited until they left Sunday to do the wash, which made sense. I still might have gotten everything folded yesterday, but Emma had a birthday party in the afternoon. I know most of her friends and their parents, so I drop her off at parties. But this was a pool party and we have differing opinions on the benefits of one summer of swim camp, so I stayed. On Friday night she and I were supposed to see a production of Shrek, but it was postponed to last night because of snow. So after the party, I had ninety minutes to get her home, fed, and out the door again. I’d planned to heat up a precooked turkey and make a couple sides but realized we didn’t even have time for that. So we went through the dreaded drive-through. And that was my weekend. It’s no one’s fault and all these diversions were pleasant so I feel guilty complaining. But I wonder if I’m going about this wrong. I don’t know right now. We have three half days this week because of parent-teacher conferences. On the upside, I don’t have to make lunches which saves me a little time in the morning. But I need to reconfigure my work schedule around bus pickups. I usually give myself Fridays off because I volunteer in the school library but I decided to take tomorrow off because I am going to fold laundry. I have one other priority for tomorrow: I’m going to drop off those books that have been sitting in the back of my car now for weeks. And the bags keep tipping over, making a mess. Even though I’m in the car every day, I stay in a small radius around my house and the school and the supermarket and a couple other places, but I have not yet made it to the library where I can leave the books. It’s about twenty minutes away and I otherwise have no reason to go in that direction. Even though the car’s not as clean as I want it, it’s actually in somewhat better shape than it was. A few weeks ago I was driving Emma and another girl home from our Brownie meeting. As they climbed into the backseat, the other girl must have caught a glimpse of the mess. 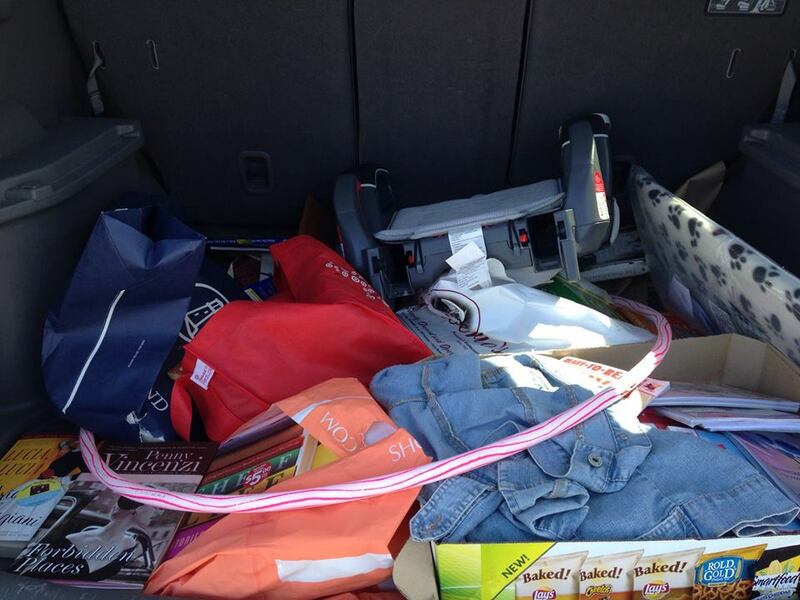 “My mom’s a hoarder,” Emma said by way of explanation. I was really not going to share this. I felt embarrassed, but I decided to let it go. I’m not a hoarder. I’m just messy and I’m working on it. 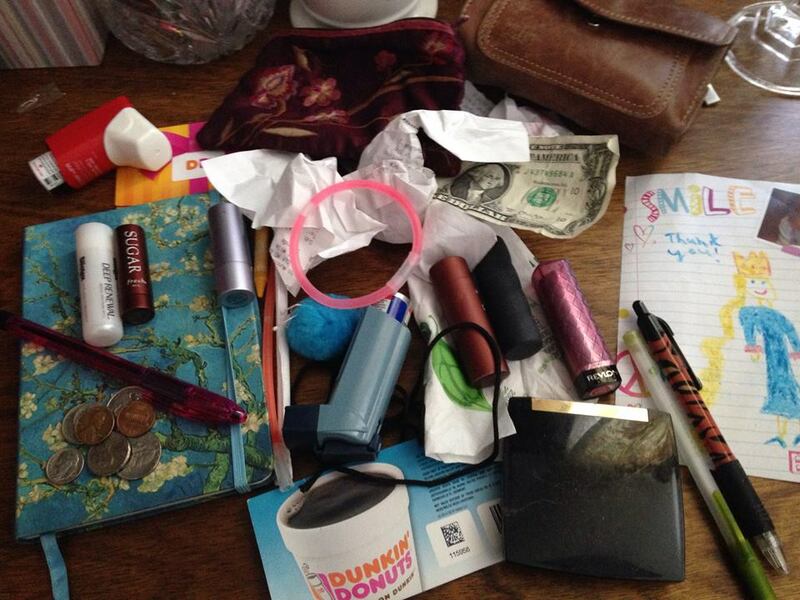 I also cleaned out my handbag. My bags are always a mess. In fact, they embarrass me more than the car. Yesterday I dumped out my bag. The innards of my handbag. 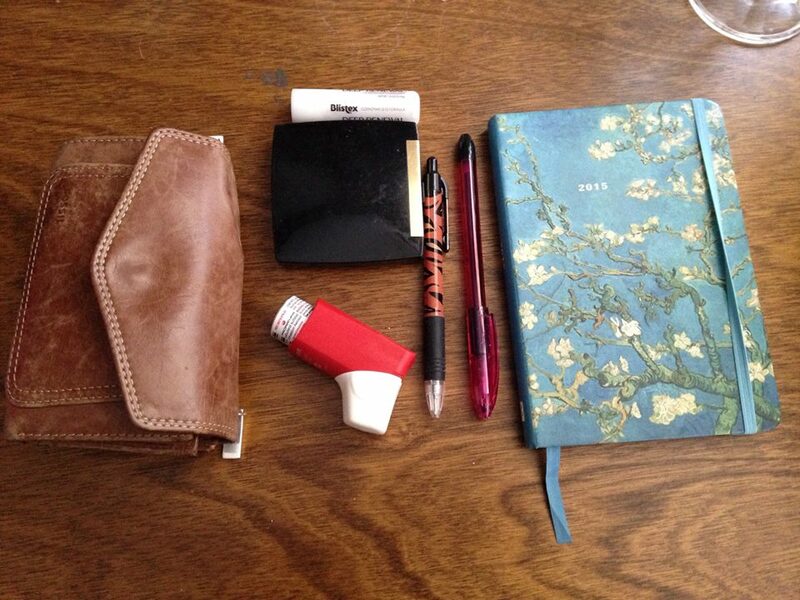 One of those inhalers was empty and has been empty for months. I seldom bother with lipstick these days, so I don’t know why I had six of them. Even though I had a small cosmetic bag in my purse, I don’t usually bother to put stuff back. There was a bit of kid related junk too, which I tossed. So, I had one small, much-needed victory for today. 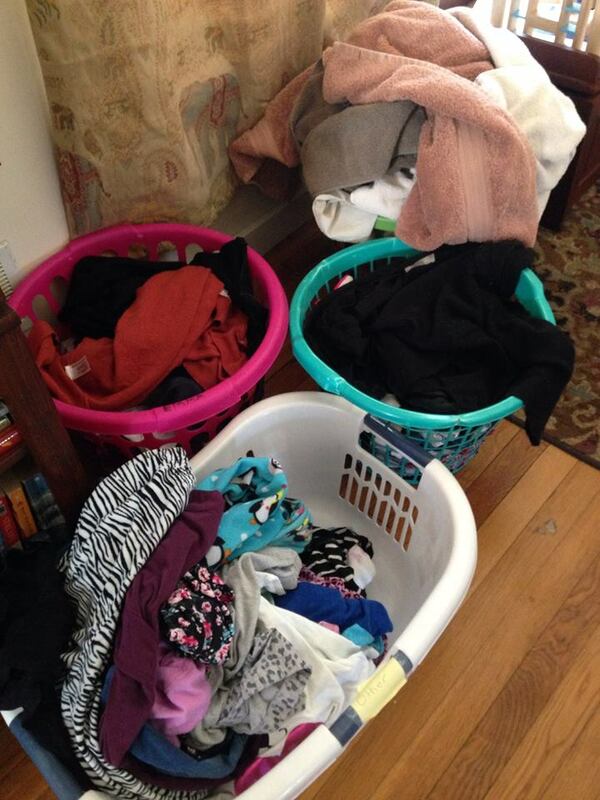 Good Heavens, girl, no wonder you had no time to do your marathon laundry folding session on the weekend! You had an EXHAUSTING weekend! And honestly, I would find it a complete drag to fold a weeks’ worth of laundry at once. Have to say, I still like my one load a day system, lol! And by the way, you did a super good job emptying out your handbag! I saw Shrek this weekend too. Maybe we were both there because Friday’s show was postponed due to the snow! I think the answer to your problem is less clothes. For real. Less. Clothes. Nope. Even less than that. Last year my family moved into a 25 foot travel trailer and I kept only the clothes I wished I was brave enough to wear. The pretty skirts, the funky pants. And every time I did laundry I still said, this is reficulous!!! Toss it. If you don’t love it, toss it. You don’t need it. For real. PS. You’re my favorite SY author yet. Keep it up! Make Emma help you with laundry. Seriously. It’s a fabulous life skill that a 7 year old should have (both laundry and helping with the family chores) and it will help keep you honest. I set up laundry wherever I’m going to have the kids for a while (if they’re going to watch a TV show, in the living room; color, near their art table, etc). My kids (3 and 5) sort the laundry into piles (mom, dad, girl, boy, kitchen and bath) and I start folding while they sort. When they’re done sorting they move onto their show or art and I finish, but am still right there and able to keep engaging with them. If I try to do it by myself in another room, it takes forever. This way, I get it done while we’d be doing something else anyway and when we finish at the same time, they can even help put away their own clothes. This is going to sound crazy..but you should try to fold them while they are still warm right out of the dryer..make it a game, and see if you can get it done. You will find that they won’t be wrinkled. Drop what you are working on, if you set your mind to it, it takes less than 5 minutes to hang and fold clothes. I fold them on my bed, have hangers ready for the stuff to go into my closet, and two baskets for the folded clothes (one for each of us) we tend to only put clothes away once a week though…I need to work on that. Congrats on your journey so far. It may not always feel like it, but you are making progress. I have been there – it gets easier the more you persist. I am married, work full time and have 2 kids (both ADHD with some LD thrown in the mix). We used to do laundry once a week, too. I started to resent how much time if took away from the things that are important. We now do a load of laundry every day (chunk the work into smaller bits). If your machine has a timer, you can have it run during the night. We either put it in the dryer or hang outside in the morning (summer only). I fold right away. Everyone is responsible for putting their own clothes away. Over time, we have found we kept wearing the same things over and over. It made it easier to let go of the unworn stuff. Enjoy your Doctor Who marathon. (I iron while I watch.) Things happen, so don’t beat yourself up for what didn’t get done — just move forward. I like to carry things in the car in *boxes* instead of bags. I get the (smallish) wine boxes from Trader Joes for carrying things in the car — books, unwieldy stacks of too-small children’s clothes, etc. They’re still light enough to life, the handles don’t rip off, and it’s really hard to overturn them! “But this was a pool party and we have differing opinions on the benefits of one summer of swim camp, so I stayed.” This really did make me laugh out loud! We do what we can do. Sounds like you did. Good luck with the folding today!